Birt’s American Bulldogs is located on a working cattle ranch in beautiful Placerville, CA. Placerville is on Hwy. 50, about one and a half hours from Lake Tahoe and about one-half hour from Sacramento, CA. Boyd’s/Ostergaard’s Danish Auroch created a great foundation for our breeding program, and since then we acquired “D and D’s Beast of Big Tyme’s,” the 2007 Bully Male Champion, Birt’s/Diehard’s Clockwork Oranje, who earned his championship in 2013, and ABNA Jr. Ch. / Eur. Ch. Wild Wonder’s Gucci, also a 2013 champion. 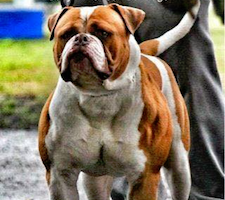 We are continually striving to create excellence in the American Bulldog. 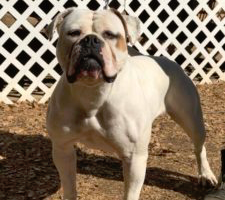 We are extremely proud to have been one of the 12 U.S. American Bulldog kennels to be included in the "American Bulldog Movie Tour" dvd, produced by Hameau des Bulls from France. At our El Dorado County licensed, non-commercial kennel, we breed for kindness, conformation, and working ability. All of our dogs are sold with ABA, ABRA, NKC, or UKC registrations. Pups are given their required vaccinations and de-worming. All dogs are sold with full breeding rights and a great guarantee. American Bulldogs are uniquely wonderful dogs. They are powerful and dominant, protective and smart! Please research the responsibility of owning an American Bulldog and become familiar with their unique characteristics prior to purchase. 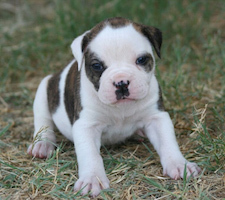 Thank you for visiting our website, and please contact us if you decide that the American Bulldog is the breed for you.